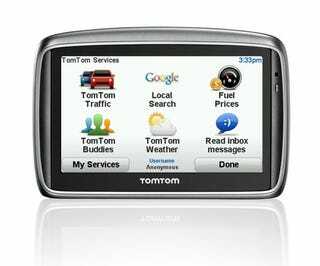 TomTom's Go 740 Live GPS is their first to have a cellular connection built-in, used to download traffic weather and friend finder information. Old TomTom's had cellular data capabilities with very limited models, over bluetooth, through your cellular handset, but model support, but having this service built in, free for a year. The unit also records map data corrections, and in Wikipedia style. And I really have been liking TomTom's advanced lane guidance, which draws a pretty nice illustration of complicated turn offs. The device works on a GPRS network, leading me to believe its on AT&T, since they've been very into providing service for devices lately. You can't really preview a GPS while sitting in a show room, but this seems like a decent device, given TomTom's move towards connectivity in it, and the hardware design is stellar, with a twist grip for the compact suction cup, and speaker grill in the back. I would like the device to perhaps get some live uploading of traffic, but as we saw with Dash, that is a hard thing to master.